Our "Agent Audio" program features a professionally edited and narrated, one minute audio "resume" on you, the listing agent. Please submit a 60 second script or very carefully completed outline of your career highlights, in and out of real estate; areas of expertise within real estate; and, most importantly, your personal accomplishments, hobbies, interests, and, if you are willing, family information. This is the information that most quickly enables a prospective buyer or seller to form a "bond" with you, and recognize common interests, backgrounds, or life-styles. Once received, our writers will edit for length, grammar, taste, and content. The completed script will then be return-emailed to the address from which the initial information was received, for your approval. Seventy-two hours later, regardless of your approval, or earlier with your emailed approval or corrections, our professional announcers will narrate the script. This narration will then be added to all of your current Imagemaker360 tours, and to all future tours, for life. A re-narration fee in the same dollar amount would then be due if you should wish to up-date or make changes to your "Agent Audio" in the years ahead... no changes, no fee! 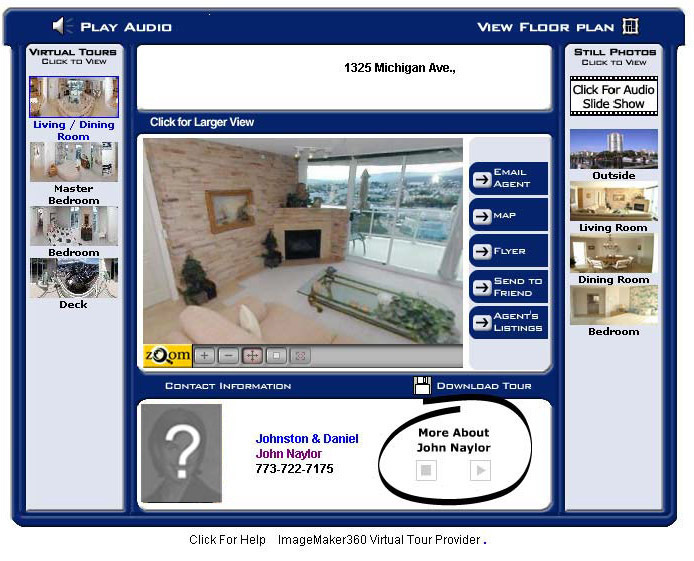 Anyone viewing your tours will have the option to "click" a play button to hear "more about you." Additionally, should two or more still shots appear on any of your 360� Virtual Tours, your �Agent Audio� will also play over the Slide Show. This replaces one of the various music tracks from which you are traditionally able to have accompany the Slide Show. At a higher price, this feature can also be offered for builder's, housing or retirement communities, developers, retailers, or resorts. Our remarkably low fee for this service gives you a competitive advantage and distinguishes you in the market, all at a very affordable price. Having this feature added to every one of you Imagemaker360 tours for this one, low price, makes this program even more cost effective. This feature will encourage the prospective buyer to contact you for the showing as they will learn more about you and become familiar with your skills, track-record, successes, and accomplishments. Those looking at properties may also be looking to sell their property, and this presentation positions you as the agent of choice to list their home.